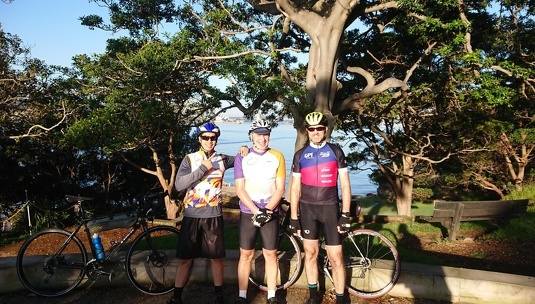 Summary : Hilly ride to Balmoral and Chowder Bay, Bradleys Head and Taronga Zoo Wharf. Cycle return to Artarmon via Mosman. NOTES: A brisk early morning ride around the lower north shore. Lights are required for this ride. Note that there will only be a few short breaks during this ride and the coffee stop will be at the end of the ride at St Leonard's station with a target finish time of 8.30am to allow time for the next ride to start at 9am. Note that the start location is St Leonards Station. Suitability For hill fit riders those looking for a shorter ride. Coffee stop Georges Heights or near end of ride. A ride through Artarmon and Mosman for magnificent coastal views at Balmoral, Chowder Bay Bradleys Head and Taronga Zoo. The ride route takes you through the backstreets and up and down all the hills in the area so you can test your climbing skills. Toilet stop at Balmoral. Coffee at Georges Heights or near return to Artarmon. We use designated cycle routes missing some of the bigger hills but keeping enough in the mix to allow you to continue your climbing practice. Return to Artarmon via Mosman and Cowles Rd using the designated cycle route.